Zero cost collar – Buy an out of money put and sell an out of money call. Cost of put will be covered by sale of call therefore zero cost. Zero cost collar = synthetic long call-spread + long underlying. How is it constructed ? Investor uses the premium received from sale of a call to finance the purchase of a put at higher strike. This strategy is combined to give a structure whose payoff resembles thet of long call-spread. What is the payoff ? When is it used ? Used when an investor does not expect the underlying to rise above the call strike level and would also like the reduce risk below the put strike level. Used especially by institutional investors who wish to lock in profit they already gain on underlying. Used when skew is relatively flat, thus implied volatility on call. Thus price for put is cheap relative to premium gained for call. Since investor buys a put and sell a call, such cheapness allows the investor to buy a relatively less-out-of-the-money-put, thus the zero cost position will shift down along the structure allowing more potential upside participation for a given level of protection. 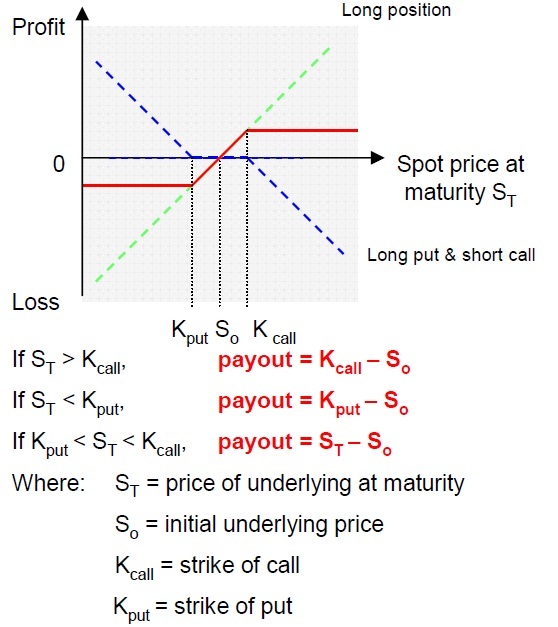 Maximum loss is limited to the difference between current spot price and put strike level. No cost is involved in the hedging, in exchange for also capping maximum gain. Locking in of gains already made on underlying by setting an appropriate put and call strike level. This allows investors to secure their gains on a given underlying once they have beaten a certain benchmark.